Shortly after we arrived at Pearl Harbor, I noticed a table outside the gift shop. 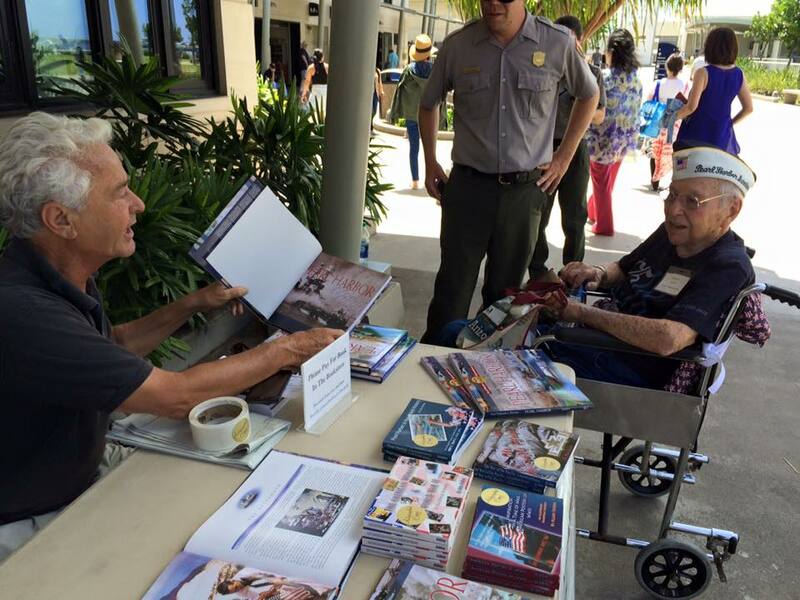 The table was filled with books about Pearl Harbor and a special book of the 75th Anniversary Edition. At the table was a gentleman who turned out to be Allan Seiden, the author of the book. I just had to wheel Ed over to meet the author. I knew they would have a lot to talk about! I introduced Allan to Ed. They had a lovely chat. Both seemed to be happy to meet the other! Ed’s Guardian,Terri, gifted Ed with a Pearl Harbor 75th Anniversary Edition signed by the author who was so pleased to share a few moments with Ed. (Ed has since spent many hours reading the book and studying the pictures!) I also purchased a copy and asked both Allan and Ed to write something in the book for me. This book is now a sweet treasure of a beautiful memory! Ed received so much attention it was overwhelming yet wonderful at the same time. We moved slowly through the grounds allowing visitors to have their moments with Ed. When it was time for the movie (a fantastic historical documentary), we moved toward the auditorium to wait in line. Survivors do not wait in line! They are escorted to the front of the line. The crowd parted. We could hear the whispers as we passed by those in the line. Ed was mesmerized by the documentary. I think if they played it again, he would have stayed to watch again and see what he missed the first time. I know I would have! As the lights came up slowly, there was an announcement. 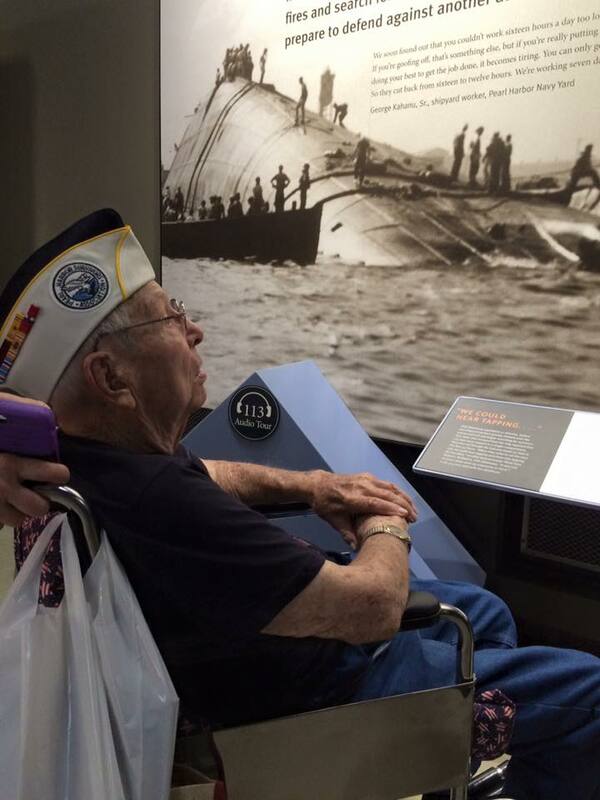 “We have a Pearl Harbor Survivor in the theatre. Please remain seated until he has left the building and is on his way to the tour boat”. As I wheeled this gracious man toward the exit, the entire audience stood and applauded him! I couldn’t hold back the tears. He choked up a little and waved his hand to acknowledge the attention. As we motored toward the USS Arizona, here was very little conversation from anyone on the boat. And then, it was only in whispers. Ed was scanning the shoreline in all directions. He later shared with us that he was looking for anything he could remember. He said the entire shoreline was nothing at all like he remembered. “Every inch of it is different.” A lot can change in 75 years! When we arrived at the USS Arizona, the mood was somber. Only the occasional whisper was heard. Ed was again escorted through first. 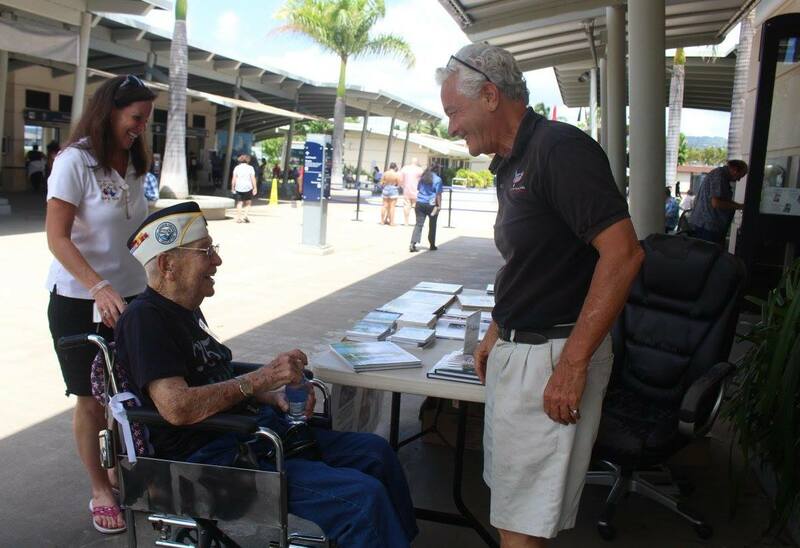 In his Pearl Harbor Survivor hat, he commands attention everywhere he goes. Those visitors waiting for the boat to go back to the museum, quickly noticed Ed was special and the cameras were raised. Dozens of photographs were snapped before we had entered the area. I walked as slow as I could. I wanted to allow Ed the time to process what he was seeing. I knew he wasn’t coming back. It also gave visitors to the museum a Survivor to see, think about, pray for, and honor as they experienced this sacred, hallowed, historical site! Ed was quiet, but taking in everything. He doesn’t miss much. As we slowly entered the area right above the USS Arizona, bombed and sunken on that dreadful day, Ed caught sight of the small oil slick creeping across the waters… We knew this could be difficult for him. I held his wheelchair right there for just another moment. The oil seeps up from the tanks of the ship. It’s a constant reminder of the lives lost inside that ship and around the harbor. But it was inside the USS Arizona Memorial… facing the wall with the names of all those who perished in the ship that day… that literally took his breath away! The tears flowed. Though he tried several times, he was unable to speak. Visitors were so touched by his reaction they were watching him and wiping their own tears as well. He sobbed as he finally was able to say, “There’s just so many!” (looking at all the names)… long pause… “They never even knew what hit ‘em”…. long thoughtful pause…then he whispered… “We were just kids.” We stayed by his side and said nothing. We held the space for his healing. He asked our guide, Dan, a question about an area of names with more recent dates. Dan explained that those are veterans who were assigned to the USS Arizona who survived the day and requested to have their remains returned to the final resting place of their shipmates. This awareness brought more tears. With his final look at the wall, Ed took a deep breath and said… ”There was no place to go – no place!… Nowhere to run!” He shook his head a few times then he fell silent. He was silent for several minutes. I have no doubt he was praying as he again looked at those names. Then I noticed he was shifting his weight and I asked him what he needed. I could see he was going to stand up. He stood and he saluted! Everyone in sight, men and women alike, broke composure and the tears flowed. When he was ready, Ed looked at me and I knew it was time to move on. As we headed back toward the boat, we stopped along the railing to see the actual ship through the water below us. Ed struggled to stand up again. He wanted to see everything possible. The visitors were incredibly generous and gracious to Ed. He wanted for nothing! Our Guide never left our side and gave Ed his undivided attention. He let Ed take his time at every view, at every sign, and every display. Ed read everything he saw and he asked dozens of questions of our guide. As the museum began closing, we began moving towards the exit. We weren’t ready. We were hungry and tired…but we weren’t ready to walk away. When we did, it was with the exhilaration of knowing each of us were deeply affected by this life changing day.